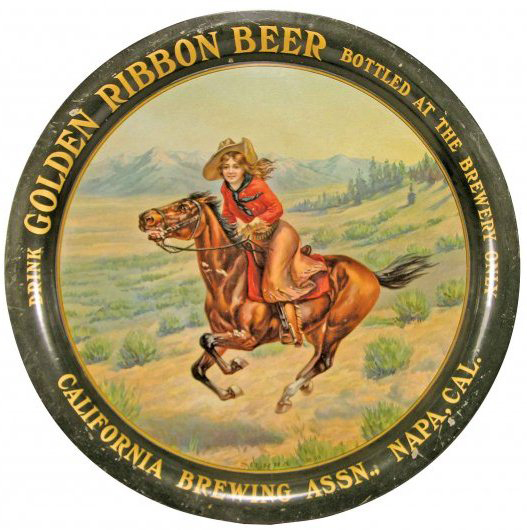 This is a very unique tray because it bears the same image of a female pony express rider galloping through a western scene as seen on the Acme Beer Tray that is also on the site. In 1917 the Acme brewery joined a combine with 5 other companies (National Brewing Co., Broadway Brewing Co., Claus Wreden Brewing Co., Union Brewing Co., and Henry Weinhard Agency) and formed the California Brewing Association. This tray dates from between that time in 1917 up to prohibition in 1920.